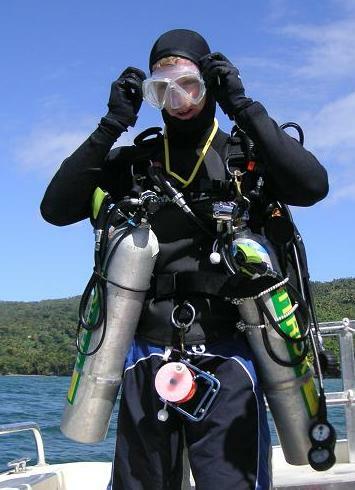 There is a whole science behind SCUBA (Self-Contained Underwater Breathing Apparatus), diving. These laws are what protect a SCUBA Diver from the pressure that the water exerts on the human body as well as safety standards for your air tank and other factors. IMPORTANT: SCUBA diving is a sport filled with many dangers and requires specialized training and equipment. Do not attempt any diving activity without proper training and always have a buddy diver or someone topside with you. The atmosphere that we breathe every day is composed of 78% Nitrogen, 21% Oxygen, and 1% of other gases. SCUBA Divers use a scuba tank (air tank), of compressed air to breath with underwater and they are made out of steel or aluminum. The air is fed from a valve at the top of the tank, via a hose and a regulator that takes the high pressure (≈ 3000 psi) of the tank and drops it down to safe levels for the diver to breath off of. 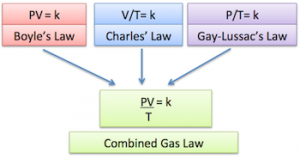 In SCUBA diving, Gay-Lussac’s law impacts the amount of breathable air you have in your tank. 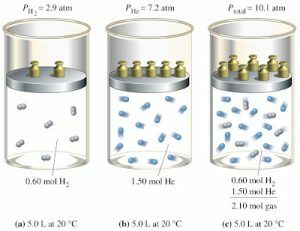 It has to do with the heating and cooling of the air in the tank during filling. An empty tank has a pressure of around 500 psi. You must always keep some pressure in the tank to help preserve and always make sure that you are filling it with dry air. So based on the above calculation we can see that after filling up from empty we are not quite full yet. So we could now that is has cooled down we can top up the tank. A fundamental rule of SCUBA diving is to never hold your breath. Boyle’s law explains why this rule exists. When a diver breathes in air from a tank, the air is at ambient pressure. This is the pressure that is surrounding the diver at the time they take a breath. 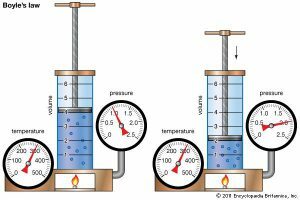 So a regulator adjusts the pressure to the ambient pressure surrounding it. When a diver breathes in the air at the surface, then their lungs would be at 1 atm. Now say that diver dives down to 99 feet, which is 4 atm. By knowing this and assuming that the diver’s lungs hold 1 L of air we can complete the left side of Boyle’s law. This means that if the diver is at 99 feet and takes a breath of air then rises to the surface holding their breath, their lungs would expand to 4 times the limit thus rupturing the lungs and probably killing the diver. So NEVER hold your breath while SCUBA diving!! By Boyle’s law we can now also see that a diver at 99 feet would require 4 times as much air per breath than on the surface so keeping a close eye on your air supply is critical, don’t you think? Because a Freediver takes a breath of air on the surface, 1 atm, and holds it, they do not have to worry about the effects of Boyle’s law on them. Their lungs actually get crushed in size, so a diver at 99 feet would have lungs a quarter of the normal size. Ok, I am going to explain this law using the example of what happens with a dry suit. Dry suits are worn for extreme cold waters, like ice diving where you actually go and dive under the ice. You wear a pair of wool long- johns and some other warm clothing under the dry suit and the suit keeps a layer of air between you and the suit. When a diver has been down for a long period of time the air in the suit can become colder, and thus less dense, than the air outside. So when they get out of the water the suit gets squeezed around them and they either have to put air into the suit to alleviate the squeeze or unzip their zippers. And that shows the effect of Charles’s Law on a diver. PTotal = P1 + P2 + P3 . 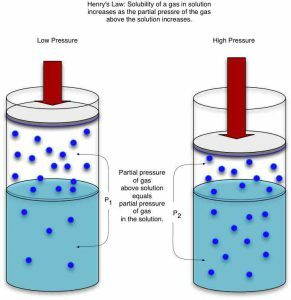 . .
Dalton’s Law states that the total pressure of a gas mixture is equal to the sum of the partial pressures of its component gases. 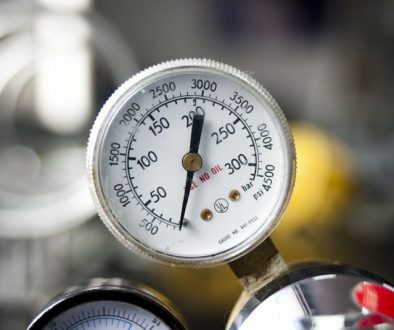 Oxygen poisoning can occur when the partial pressure being breathed is above 1.6 atm. 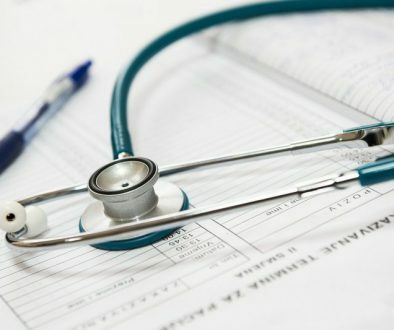 It will cause seizures, dizziness, vertigo, and changes in vision. Any of these can be fatal to the diver. Imagine being at 99 feet and having a seizure or you start to vomit because of dizziness or vertigo. It would be a really bad situation don’t you think? So to calculate at what depth this may occur we can use Dalton’s law. As mentioned earlier dry air is made up of mainly 78% Nitrogen and 21% Oxygen. Thus at 1 atm, the partial pressure of Oxygen would be 0.21 atm. So to get the partial pressure of Oxygen to 1.6 atm we would need a total air pressure of 7.6 atm (1.6/0.21 atm). So, therefore, you would need to be at around 216 feet to begin to be in the danger zone. Remember the 78% Nitrogen in the air? Well, a diver can get Nitrogen Narcosis whose effects are very similar to being drunk. The deeper you go the more the effect intensifies. Nitrogen Narcosis can start occurring as shallow as 45 feet and deeper. You will get head spins, nausea, and fumble around trying to use your equipment just as if you were drunk or start doing stupid stuff like feeding the fish your air. 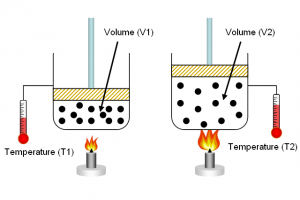 Henry’s law states that the solubility of a liquid is directly proportional to the partial pressure of the gas above the liquid. To a diver, this means that as you go deeper the pressure will increase. Because of this, the air is forced into your bloodstream at a faster and faster rate the deeper you go. So when ascending to the surface you need to “bleed” off all that air in the bloodstream. This is why there are decompression stops after long deep dives. This is to get all that air/gas back out of the bloodstream SLOWLY. If you ascend too fast then the air/gas comes out too fast in the form of tiny air bubbles (like Champagne), that stay in the bloodstream and get distributed throughout the body. These tiny bubbles tend to collect in the joints and under the skin. This causes extreme pain, convulsions, blisters and even death. This is called DCS, Decompression Sickness or more commonly called “The Bends”. This is why using your Dive Tables is so important. If you would like to know how to read your Dive Tables then take a look at the article on how to use your Dive Tables. 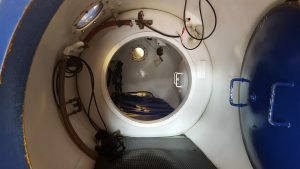 You have to be treated in a Hyperbaric Chamber to be cured of DCS and they are very expensive and are few and far between (not readily available around the world). Even though this is not a gas law it still applies to the SCUBA diver. 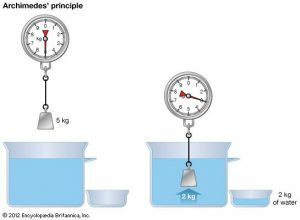 Archimedes’s Law states that any body completely or partially submerged in a fluid (gas or liquid) at rest is acted upon by an upward, or buoyant, force the magnitude of which is equal to the weight of the fluid displaced by the body. Well, that wraps up the science behind SCUBA Diving, I hope that you found it interesting and informative. 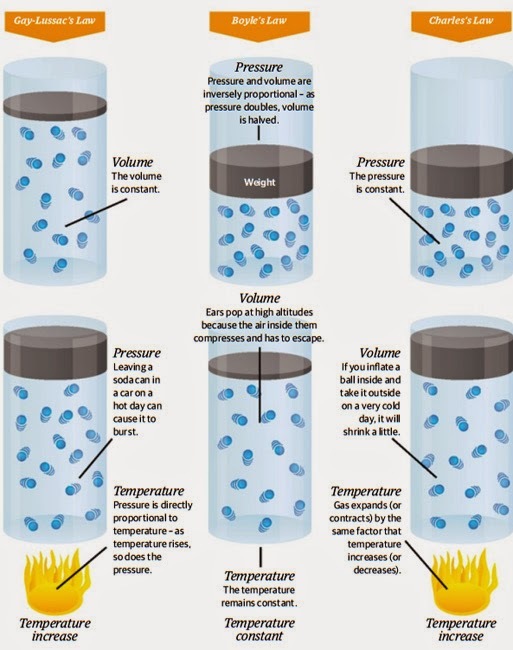 Pressure is inversely proportional to volume, or higher volume equals lower pressure. 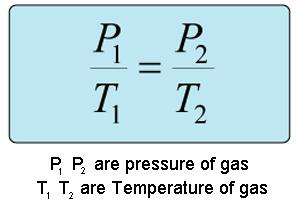 Pressure is directly proportional to temperature, or higher temperature equals higher pressure. Please if you have any comments or questions, please feel free to leave a comment below and I will gladly get back with you. Thanks for stopping by. Just looking into scuba diving as a hobby, maybe even one day as a job. There’s me thinking you just grab a tank of air and go for it haha. I never knew there was so much to it. What a great read! I shall be sharing.